Eyebrows help shape the face and have a dramatic impact on the way that eyes are defined. They have the ability to make our eyes looks smaller or larger, and with Mineral Powders you are able to fill the brows with color to enhance overall facial structure. This simple 3-step system includes everything necessary to shape and fill the eyebrows, and finish everything off with a beautiful brow highlight. The shades are made with 100% natural minerals which will not irritate the skin or block pores. Polished, defined brows have never been easier! Zinc Stearate, Zinc Oxide (CI 77947), Dimethicone, Tocopheryl Acetate (Vitamin E), Magnesium Stearate, Phenoxyethanol. May contain +/- [Carmine (CI 75470), Ultramarines (CI 77491), Manganese Violet (CI 77742), Titanium Dioxide (CI 77891), Mica (CI 77019)]. Step 1: Using the Tweezers provided, remove any stray hairs that are not in line with your brow. Make sure you do not over pluck the brow, to keep the most natural brow look. 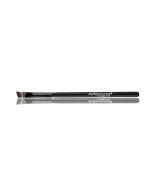 Step 2: After the brow has been shaped, tap the included Brow Brush into the Powder shade that most closely matches your natural brow hairs. With light strokes fill in your natural brow shape. Start at the arch of the brow near the corner of your eye, moving along the brow to finish at the end. Step 3: Once the brows are filled in, polish off your look by applying the Highlighter directly underneath your brow. This will enhance your brow bone, making your brows appear higher and eyes more awake.